The city Major decided to restore the old tower on the hill, but he didn’t keep in mind the monsters who hide in the garret. Frightened and angry, they turned the house upside down and cut off the power, making the residents run away. Only four monsters hunters have no fear of entering the dark tower to catch them all! 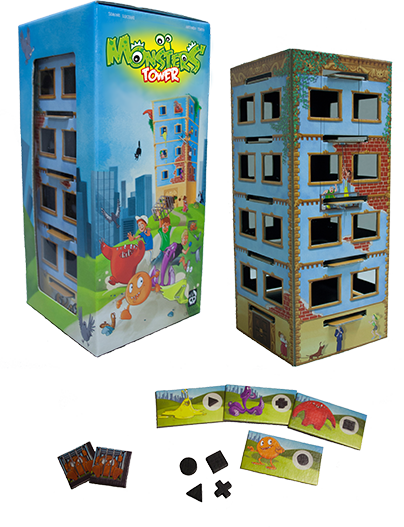 The Monsters Tower is a crazy family game in real time. A huge 3D building is filled up with monster pawns. Players will insert their fingers in the tower through the windows and try to push their target pawns down to the ground floor. The funniest thing is that they only have one minute and the will play all together at the same time!